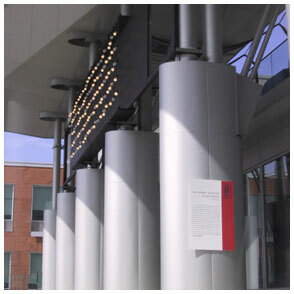 125 household lightbulbs create an interactive marquee on the facade of Kitchener City Hall. For Power to the People, the 2002 Kitchener Contemporary Art Forum, we created an interactive marquee that the public could control. "As we celebrate the 100th anniversary of the conception of public hydroelectric power in Kitchener, P2P highlights the ubiquity of the most basic icons of the electric age: the household switch and bulb. Significantly situated at the entrance to City Hall, P2P puts the marquee, a now-ubiquitous and iconic tool of corporate communication, into the hands of the general public. By engaging in the everyday unconscious activity of flipping a light switch, citizens are able to communicate directly, without the oversight of a centralized authority, within a government-owned public space. Literally and figuratively, P2P brings Power to the People." More information about P2P is available here. Concept, Design: Gorbet Design, Inc.